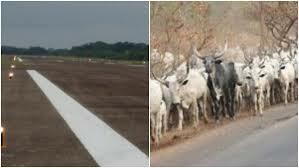 The Federal Airports Authority of Nigeria (FAAN) has suspended the head of aviation security in Akure, Ondo state, following the invasion of the airport runway by cows on Saturday, February 17. Punch reports that an Air Peace flight from Lagos was at about 12:15pm on Saturday, February 17, prevented from landing at the Akure airport, as cows took over the runway. Eyewitnesses said it took the efforts of airport security and other aviation staff to clear the runway. The general manager, corporate affairs, FAAN, Henrietta Yakubu, said on Monday, February 19, that the agency was not unaware of recent developments at some airports within the country with respect to security breaches, and had started putting measures in place to improve security. Yakubu stated: “We have taken various initiatives and measures to guard against breaches of any sort at all our airports nationwide. It will be recalled that there had been serious allegations of security breaches at some airports recently, the latest being the incursion of the Akure airport runway, which led to a temporary disruption of landing procedures of an inbound Air Peace flight. “While we apologise for the incident, we want to state that officers of the security department quickly dispersed the cows from the runway to allow for a successful landing of the flight.